I’ve recently been introduced to a new expression of whisky from the Glen Moray brand (or to be exact, two – see you at the finish). Now this is a name that has never graced these pages before, so it only makes sense to dive into the back-story a little and see why the new port cask finish should be given the time of day. Glen Moray started life as West Brewery in Elgin on the banks of the River Lossie, run by a family company named Robert Thorne & Sons. In 1897, the brewery site was converted to a distillery and bought themselves two stills. Following a fire and extensive rebuilding program at their Aberlour Distillery, the company focused on production of Aberlour whisky, allowing the Glen Moray distillery to run down. The site closed in 1910, then reopened a few years later, only to once again close before 1920 hit and Macdonald and Muir took over the distillery. During the 1970’s, the two original stills were replaced and two further stills were added. In 1996 however, Macdonald and Muir Ltd renamed itself Glenmorangie Plc and in 2004 the group was acquired by Louis Vuitton Moët Hennessy, for the sum of £300 million. 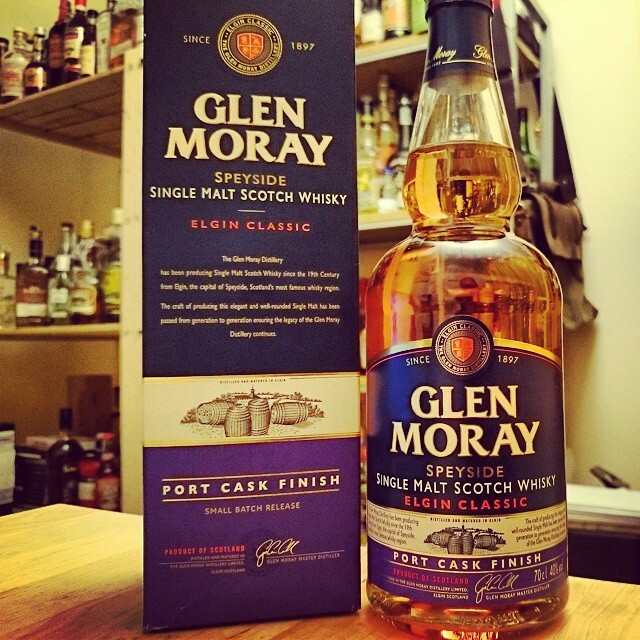 Most of the whisky from Glen Moray has long since been used in blended Scotch. More recently, the Glenmorangie Co decided to cease producing whisky for blending and subsequently, in 2008, the distillery was put up for sale. A small batch release single malt, matured in American Oak barrels and finished for eight months in Port pipes sourced from Gran Cruz in the Douro Valley in Portugal. Light oak with rich, ripe red fruits dominating on the nose. Bold flavours of lively spice, citrus and juicy plums on the palate, creating a rich port soaked wood finish that dominates an incredibly long finish. A very interesting dram there, with plenty of punch that you would expect from the port pipes used. A treat to be enjoyed for Christmas, or a Winter evening with friends. Plenty going on for an experience of one of Speyside’s hidden gems. Other expressions we should be looking out for in the range include Glen Moray 10yr Chardonnay Cask Matured, 12yr and a 25yr Port Wood Finish. A bold hit of dry sherry upon the nose, with deeper tannins coming through on the finish. Light, creamy with a warm palate cleanse that flows into soft honey, dry sherried oak and a lick of coriander on the long, lingering finish. This will be available from specialist whisky retailers and Sainsbury’s from July, with a RRP price of around £22.00.